Turner Farm Park affords a clear view of the skies, drawing a regular crowd to set up telescopes. Below, after the sun sets, Jay Petras of Great Falls supervises as his daughters Alexandria, 7, in foreground, and her sister Jacqueline, 5, observe the moon. Turner Farm Park in Great Falls is at the heart of the darkest nighttime spot within 30 miles of Washington, according to a recent study of light pollution in the area. And that suits the crowd that gathers there most Friday nights just fine, because within Turner Farm lies a special area called Observatory Park, a nexus of Northern Virginia's burgeoning astronomy scene. On one of those recent Fridays, the park's visitors included members of the Northern Virginia Astronomy Club, teachers from several Fairfax County school planetariums, an astronomy instructor from George Mason University and many locals -- families with children, middle-aged hobbyists, teens and senior citizens. All were drawn to the park for its great view of Mars, which this past summer made its closest approach to Earth in about 60,000 years. Stargazer Lee Ann Hennig, 56, said looking at planets and stars is "a connection that you make." The astronomy teacher at Thomas Jefferson High School for Science and Technology said she sometimes wonders if there are other living beings in the deep reaches of space looking back. "It's kind of like a fundamental connection, I think. You always have that question, 'Are we the only ones?' "
A wave of people from the Fairfax area is interested in making that same connection. Over the past few years, astronomy has been attracting increased participation. The 800-member Northern Virginia Astronomy Club has gained nearly 300 people in two years. George Mason University recently launched an astronomy program. Nine county high schools have planetariums, rare for a public school system. NASA counts two astronauts who graduated from Fairfax high schools. In one of the most ambitious signs of astronomy's appeal, a nonprofit group is working with the county Park Authority to build a new observatory at Turner Farm Park and turn part of the 52-acre grounds into the area's first astronomy park, where sky-watching events would be held for enthusiasts as well as schoolchildren. "The views through a telescope stimulate our imagination in a way nothing else can," said Charles H. Olin, 70, of Great Falls, a retired Smithsonian Institution physicist and founder of the Analemma Society, a local group that is pushing for the astronomy park. "I have a five-inch Astro-Physics refractor, which is a fairly high-end piece," said Alan Figgatt, 44, of Reston, referring to a telescope that offers clear views of the planets, distant stars and nebulas. He said amateur astronomers spend time "endlessly debating about what is the best type of telescope, just like [enthusiasts do] with golf clubs, fishing poles or cars." Gary B. Purinton, 53, Analemma's vice president and planetarium director at Falls Church High School, admired Figgatt's instrument. "It's not the biggest telescope, but this telescope has a reputation," he said. "It has very nice optics in it. I looked through [it], and I've never seen Mars look like that before. I could see light and dark colors and areas in the ice cap." Four or more telescopes would be housed in a roll-top building -- one in which the roof rolls back for viewing the night sky -- at the proposed Observatory Park stargazing center. Analemma would supply the scopes, including a seven-inch Astro-Physics refractor and 16-inch Newtonian reflecting telescope, and it is trying to raise up to $90,000 for the new roll-top building. A barbecue fundraiser last weekend netted several thousand dollars. Other features, such as a sundial garden, education center and museum, would follow, according to the Park Authority's master plan. The full cost could run into the millions of dollars, park officials said. The existing observatory would be used as another building on the complex but not for watching the sky. "The park is designed around ancient instruments, such as sundials and quadrants -- pre-telescopic instruments," Olin said. "But it also includes the latest technology as well: the radio telescope and four or five beautiful telescopes that we have. There will be a building here that the students can actually learn how early navigators learned to navigate, how they were able to rely on their objective thinking to make sense out of it all." Olin said he is especially excited about the astronomy park's potential for stimulating children, who he said would be "indelibly enriched" by viewing the planets, moon and stars. "This experience will live with them throughout their life," he said. Many of the nine planetariums at county high schools were built during the era of the 1960s space race. Hennig, who began her Fairfax teaching career at what was then Fort Hunt High School in 1969, the year astronauts walked on the moon, said the planetarium offers something that you don't see in a public school system that often, in terms of the number of planetariums. "We are very proud of them, and we work hard to keep them running and keep them in top-notch shape." The two current astronauts from county high schools are Catherine G. "Cady" Coleman, 42, who graduated from Woodson High in 1978 and is a veteran of two missions aboard the space shuttle Columbia, and Patrick G. Forrester, 46, who graduated from West Springfield High in 1975 and flew in the shuttle Discovery. Coleman said the science classes she took at Woodson "had a huge impact" on her career. "The teachers were so excited about what they did," she said. "In Fairfax County, they have made classrooms and facilities where you walk in and your world changes." Jared R. Milton, 17, a senior at Jefferson High, is in an astronomy mentorship program at the Air and Space Museum. Under the tutelage of James R. Zimbelman, chairman of the museum's Center for Earth and Planetary Studies, he is studying satellite photos and comparing wind erosion patterns on Mars with those in the Nevada desert. Jefferson's planetarium in part nurtured Milton's interest in the science. "There was a whole aspect of the night sky that I knew nothing about," said Milton, who is considering studying astronomy in college. George Mason University undergraduate students now can major in astronomy. Ten have signed up since the program began last year, said instructor Harold A. Geller, 49. Mason is also where the Northern Virginia Astronomy Club holds its monthly meetings, which are open to the public. 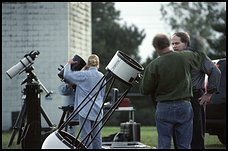 The club, which says it is one of the nation's largest such amateur groups, often uses its meetings as opportunities for members to compare telescopes, accessories and other gadgets, find information about upcoming astronomical events and ask questions of the group's more experienced members. As if there aren't enough stargazing groups in the area, teachers from Fairfax, Arlington and Prince William counties belong to an informal organization called the Northern Virginia Planetarium Society. Among their initiatives: to start an astronomy student Olympiad. "The thing about astronomy that just makes it so intriguing is that the subject is continually evolving," said Mike J. Sponable, 39, Edison High School's planetarium director and a member of the teacher organization. "We have different happenstance on a weekly, daily basis. If you go back to February and the tragedy of the space shuttle [Columbia], what is coming out of that? How is it going to reshape NASA? What will the impact of that reshaping be on future exploration missions?" Sponable asked. "What do we gain in terms of knowledge that we put in textbooks and that we'll put in to lectures and seminars? That is what is so amazing about astronomy." For Analemma's Purinton, the appeal is more philosophical, even spiritual. "When you go outside at night, it kind of puts you in your place," he said. "It reminds you that you're just a small part of the universe. Personally, it's a religious thing for me. To me it just shows the awesome power of God to create all this." "It's awe-inspiring to think about things that are so far away -- the light we are now looking at left [the stars] millions of years ago in some cases," he continued. "I think the problem nowadays is that people have so many things to do inside. If nothing else, there is television. They don't even realize what is right outside their door, if they just go out and look up at night."